Durban – School leavers applying to study at the University of KwaZulu-Natal will be required to register for a compulsory course in Zulu from next year, in a first for the South African higher-education sector. In what the university calls a “watershed” moment in its history, it has decided that students need to demonstrate bilingualism to earn their degrees. The institution’s senate on Wednesday voted in favour of the new policy, which would apply to all undergraduates, irrespective of which programme they were enrolled in. Dismissing the “myth” that indigenous languages were not suited for “high-level thinking and research”, UKZN said it believed the move would promote social cohesion. Currently, only health sciences students are required to complete a module in Zulu. 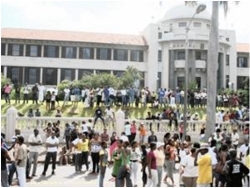 UKZN deputy vice-chancellor Professor Renuka Vithal said that both staff and students had asked that the course be extended to all degrees at undergraduate level. From next year until 2018, staff and students would learn enough Zulu for verbal academic interaction and would have to take an exam. The course would be one semester long. From 2019 to 2029, writing skills would be developed, in keeping with the objectives of UKZN’s transformation charter. “At a university where more than 60 percent of students are Zulu-speaking, the institution has an obligation to ensure linguistic choices result in effective learning solutions. Additionally, in a country that continues to be divided on the basis of linguistic identities, language should serve to bring diverse learning communities together and promote social cohesion,” Vithal said. UKZN was assisting in producing Zulu terminology in subjects such as law, economics, physics, chemistry and anatomy. The level of Zulu required for different subjects would depend on the degree being studied for. Vithal emphasised what was revealed by Census 2011 earlier this year – that Zulu was the most widely spoken home language in the country. She said that, on average, 48 percent of first-year students who were enrolled at UKZN between 2007 and last year said that Zulu was their home language. Of the intake of 6 124 students last year, 59 percent studied Zulu as a home language. Professor Ian Scott, of the Centre for Higher Education Development at UCT, deemed it a “very ambitious” move on UKZN’s part. Scott said the challenge for any university in going this route was in finding the space in the curriculum. He said mastering Zulu could be difficult for students who had not taken it at school and while it was possible, a high level of competence in the language could not be expected. UCT students studying the health sciences were also required to learn how to communicate in Xhosa, and to be aware of how culture contributed to the patient’s concept of health and illness. The focus was, however, on oral communicative competence rather than written skills. Speaking on the issue of multilingual language planning in general, Professor Leon de Stadler, the director of the Stellenbosch University’s Language Centre, suggested that a truly democratic society could not exist without a truly democratic multilingual dispensation, and that a huge body of research pointed towards the value of a multilingual approach. However, he was not in favour of compulsory courses. “It is not always practical or affordable but, even worse, it can create a lot of negative attitude regarding language promotion and language teaching,” he said. Stellenbosch University had sought to promote both Afrikaans and Xhosa, through presenting short courses and terminology development. It had already published glossaries in law, psychology, economic and business sciences in Afrikaans and Xhosa. “But it’s about more than just being useful in some situations. It is also a symbolic act through which we indicate the value of languages and their potential to develop as far as we need them to do,” De Stadler said. Frans Cronje, deputy head of the South African Institute of Race Relations, said UKZN risked eventually excluding non-Zulu speakers, and that the course should instead be voluntary. Article provided by The Mercury.